While most children readily acknowledge the presence and existence of God and His place in their lives, it is another matter altogether for them to understand God’s place in religion. 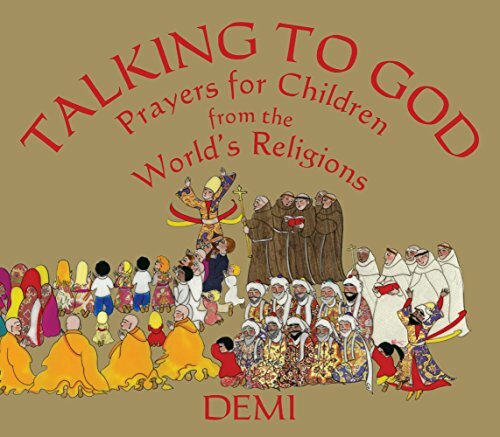 Demi’s latest book, Talking to God, provides a tangible, if broad and basic, context for introducing children to world religions. Each religion, Demi explains in her Preface, offers a way to communicate with God through prayers of praise, petition, gratitude, and blessing. The nature of prayer is ongoing, relationship-building, and life-giving. Demi’s book will also add tolerance fostering and respect generating as outcomes to learning about prayer as children turn the pages through each culture’s approach. Christianity, Judaism, Islam, Hinduism, Taoism, Shintoism, American Plains Indian, and Central Africa share space together, joined by a sensitivity and grace embedded in each stunningly appropriate and relevant illustration. Readers are treated to confident artistry with great attention paid to the details of robes, architecture and setting, posture and religious symbolism. For Islam, for instance, the woven rug upon which the devout men are knelt is indicative of the rich decoration and jeweled tones of the region. Meanwhile, the women, in full chadors, gather in the balconies as the imam preaches the Friday sermon. Demi makes a point to let the reader know how she categorized the religions. What might have been interesting to add would be a note indicating that while these are the major world religions, they are not by any means all of the world’s religions, in fact, there are over 4,000. Critical to the success of this project are two sets of explanations Demi has included at the end of the book. First is the list of Demi’s sources for the prayers she has selected. She cites specific passages from the Bible, the Koran, the Metta-Sutta, and the Tao Te Ching, among others. Second is the notes list describing her illustrations page by page. She points out symbols, religious architectural landmarks, or important ceremonies and prayer times that she is depicting. Without these pages the book would not be nearly as effective, they offer children meat, meaning and depth. More importantly, they will serve to sustain dialogue. The concluding page spread is a reverential nod to the universal meaning of prayer in the world. All religions give thanks to their divine and this gathering of the peoples from all faith traditions celebrate together. “If only this vision could be truth,” is most likely the prayer on their collective lips. While the overall collection and presentation is just right for the target age group, the title is a bit off, if not a bit demeaning. The prayers selected have absolutely nothing to do with children. There is not a specific prayer in any of the religions that the children say because of the age they are. Nor are the prayers said for the benefit of blessing children alone. The prayers are all chosen because they are generally representative of their religion, there is nothing juvenile about them. The words “for Children” are entirely unnecessary. Removing them from the title would make a world of difference, and it would still be obvious that this is a children’s picture book. Title criticism aside, this remains a very valuable book and a natural step in Demi’s creative theme. Talking to God follows in the footsteps of her other folk stories and religious titles—Saint Francis of Assisi, Mother Theresa, The Fantastic Adventure of Krishna, The Empty Pot, etc.—and maintains the same caliber of artwork.